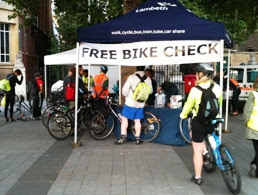 This evening, Wednesday 6 July 2016, Lambeth's Dr Bike team will be offering free bike checks 5:30 -7:30pm in Windrush Square, Brixton, SW2 (near the library). Come along and get your bike ready for cycling through the summer. The Dr Bike team can fix basic problems, adjust your bike and offer advice on further action if required. The Police will also be attendance security registering and marking bikes. In addition the HGV awareness team will give you the opportunity to sit inside a lorry cab and get advice on how best to position yourself in the road so that you are not in the driver's blindspots.